Seattle Seahawks wide receiver Paul Richardson, right, comes up with a reception for a touchdown next to Detroit Lions strong safety Tavon Wilson (32) in the first half of an NFL football NFC wild card playoff game, Jan. 7, 2017, in Seattle. The formula that has led the Seattle Seahawks to unmatched success over the past five seasons returned. A healthy dose of Thomas Rawls rumbling on the ground. A few timely throws by Russell Wilson helped by some remarkable catches. And a defense that never allowed Detroit a sniff of the end zone. Rawls rushed for a franchise playoff-record 161 yards, Paul Richardson made one of the catches of the year for his first career postseason touchdown, and the Seahawks beat the Lions 26-6 on Saturday night in an NFC wild-card game. "It kept the chains going," Rawls said. "We want to end like this. We want to end with a great mark running the football, which is our identity, playing tough hard-nosed Seahawks football, and that's exactly what we did." Seattle won its 10th straight home playoff game, continuing Detroit's miserable conclusion to the season that finished with four straight losses. Detroit's long playoff history without postseason success continued: no playoff wins since 1992. No road playoff wins since 1957. Rawls was the workhorse as the run game the Seahawks became known for when Marshawn Lynch was in the backfield finally found consistency that was missing all season. Rawls bettered Lynch's 157 yards in the 2014 NFC championship game against Green Bay. Rawls had runs of 12, 14, 26 and a 32-yarder late in the third quarter, when Wilson ended up being his lead blocker. Rawls capped his night with a 4-yard touchdown run that gave Seattle a 19-6 lead. 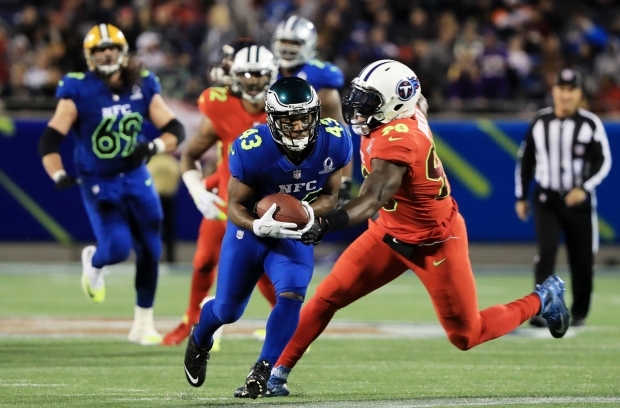 He was the first player with at least 150 yards rushing in a playoff game since Lynch's performance against the Packers. While Rawls did the grunt work, Richardson filled the highlight reel with a trio of catches. None was better than his 4-yard touchdown in the second quarter to give Seattle a 7-0 lead. Richardson went horizontal reaching out with his left hand to cradle the pass as he was being interfered with by Tavon Wilson. What wasn't called on the play was Richardson's right hand yanking on the facemask of Wilson as he reached to make the catch. Richardson had another one-handed catch in the fourth quarter, and Doug Baldwin got into the act of amazing catches, pinning a 10-yard reception to the back of his leg late in the fourth quarter to continue a Seattle drive. Two plays later, Baldwin's 13-yard touchdown reception put it away. Wilson finished 23 of 30 for 224 yards, while Baldwin had 11 catches for 104 yards. 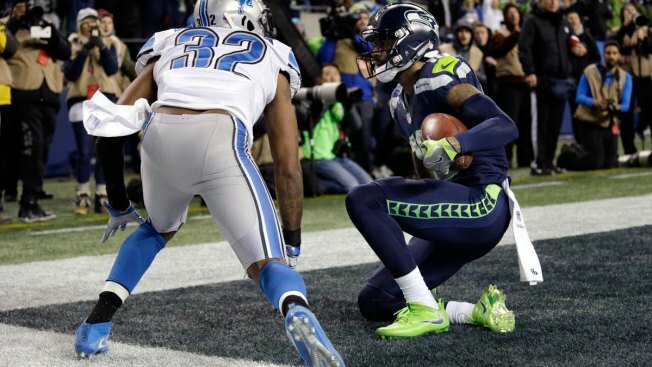 Overshadowed by the offensive performance was Seattle's defense shutting down the Lions. Hampered by a handful of dropped passes and some untimely penalties, the Lions could only manage a pair of long Matt Prater field goals. Matthew Stafford was 18 of 32 for 205 yards. He was sacked three times and Detroit never ran a play inside the Seattle 33-yard line. "We definitely knew if we came in and focused, we'd be fine," All-Pro linebacker Bobby Wagner said. "We knew they got some great players on the other end, but we were just locked in all week and we prepared very well. We knew were going to play well." Seattle was 4 of 11 on fourth downs during the regular season, but got two big conversions on its first touchdown drive. On fourth-and-1 at the Detroit 39, Rawls bounced for 4 yards; the drive was capped by Richardson's catch on fourth-and-goal from the 2. Detroit wasn't so successful. On its third possession, it went on fourth-and-2 from the Seattle 38. The oddly designed play had Stafford throwing behind the line of scrimmage to Matthew Mulligan. The play was blown up by Wagner and K.J. Wright for a 2-yard loss. Prater became the first kicker with multiple 50-yard field goals made in the same playoff game, and Seattle's Steven Hauschka was true on both of his field goal attempts. But Hauschka missed his seventh extra point of the season after Rawls' touchdown with 8:43 remaining. Detroit: The Lions will lament the end of their season. After getting its record to 9-4, Detroit lost its final four games. Seattle: The Seahawks will face the No. 2 seed Atlanta Falcons next Saturday. Seattle beat Atlanta 26-22 in October. "We're expecting a fight," Wagner said. "They're going to come in rested. They're going to be hungry, but we're hungry, too. We're going to come out and give 'em everything we got."